Tom Howard was my friend and my cousin. His father was the Poet Earl of Surrey, his mother was my aunt Frances de Vere. Tom was born on 10 March 1536, fourteen years before me. He was the closest thing I had to an older brother, though we didn’t grow up together. We both lost our fathers early, and were raised as royal wards. I tried hard to save Tom’s life at the beginning of 1572, after he was convicted of treason for conspiring to marry Mary, Queen of Scots and put her (and himself) onto Elizabeth’s throne. There was no keeping his head on his shoulders. Instead of remembering Tom’s death on the 2nd of June, I’m posting this today, on his birthday. An acquaintance was reading about the Wars of the Roses and the Tudors. Internet-averse, they had trouble keeping the various nobles straight, when generations would change but the names often wouldn’t. So I made crib-sheets to help, and this is an adaptation of the one I did for the Howards. It’s not meant to be all-inclusive, and the details are more personal than scholarly, but it fills in the 15th and 16th centuries for keeping tabs on which duke lived when, did what to whom, and died how. An arrow → means offspring, father to inheriting son in the direct line. • Born in or before 1255, died 1308. • Lawyer and judge, member of the House of Commons in the Model Parliament of 1295. • Knighted by Edward I. • The first documentable Howard of note. Hereward the Wake, resister of the Conqueror, is a more legendary but less provable antecedent. • Born 1385, died 1436, before his father. • Fought for Henry V in France, probably in the company of John Mowbray, 2nd (Mowbray) Duke of Norfolk. • Married the Duke’s sister Margaret c. 1420. The male Mowbray heirs did not survive, leaving Margaret the co-heiress. Lucky Robert, and luckier son John. This was a big step up. • Born c. 1425, died 22 August 1485. • Knighted by Edward IV at the battle of Towton, 29 March 1461. • Created 1st Howard Duke of Norfolk in June 1483 by Richard III, who needed all the noble friends he could make. John’s son Thomas was created Earl of Surrey at the same time. For Dickon thy maister is bought and sold. To put a little more Shake-Speare into this not-very-Shakespearey post, here’s where I got that ditty. I didn’t make it up. It came from The vnion of the two noble and illustre famelies of Lancastre & Yorke, also known as Hall’s Chronicle, first published in 1548. For Dyken thy mayster is bought and solde. Jack of Norfolk commanded the vanguard of Richard’s archers that day, opposite my ancestor John de Vere, 13th Earl of Oxford, whose archers formed the Tudor vanguard. The story as I heard it when I was small is that Norfolk lost his helmet in an altercation with Oxford; a family feud over disputed inheritances added to their animosity. (Civil wars become personal fights.) Then, helmetless, Norfolk took an Oxfordian archer’s arrow in the face, which killed him. Yet all this notwithstanding, he regarded more his oath, his honour, and promise made to King Richard; like a gentleman and a faithful subject to his prince [he] absented not himself from his master, but as he faithfully lived under him, so he manfully died with him, to his great fame and laud. For published words about someone who died fighting for a reviled loser, in a narrative with a hard slant toward the winner, that is high praise. 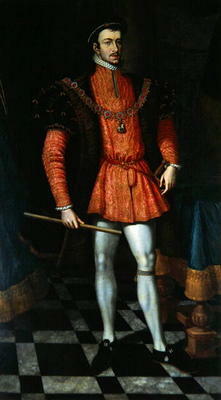 Jack Howard was attainted posthumously by the first Parliament of the new Tudor king’s reign. • Born 1443, died 21 May 1524, age about 81. • Wounded in the fighting that killed his father. • Imprisoned and attainted after Bosworth. Henry VII backdated the start of his reign to the day before the battle, turning Yorkists into traitors who thus forfeited their goods and titles. Henry never missed a trick. • Prisoner in the Tower, 1485 through 1488. In May 1489 Henry released him and returned some of his inherited estates, but only the Surrey earldom, not the Norfolk dukedom. • Still Earl of Surrey at Henry VII’s death in April 1509, into the early years of Henry VIII’s reign. • In September 1513, his seventieth year, his forces defeated the invading Scots and killed King James IV at Flodden in Northumberland, while Henry was in France, besieging Tournai. • Finally granted the dukedom in 1514, after his success against the Scots. Now you know: the Flodden Duke was not a duke at Flodden. • Thomas, later 3rd Duke. • Edward – made Lord Admiral by Henry VIII in 1512. Killed at sea fighting the French in 1513. • Edmund – ne’er-do-well black sheep, father of Catherine Howard, 5th wife of Henry VIII. • Elizabeth – married Thomas Boleyn. Mother of Anne Boleyn, 2nd wife of Henry VIII. • Born 1473, died 25 August 1554, age about 81. • After Flodden, created Earl of Surrey for life (not inheritable). Became 3rd Duke upon his father’s death in 1524. • Married Anne of York (Plantagenet) in 1495, fifth daughter of Edward IV. This made him brother-in-law to Henry VII. Anne died in 1511. None of their children survived. • Married Elizabeth Stafford in 1513, daughter of Edward Stafford, 3rd Duke of Buckingham. This marriage became famously dysfunctional. Norfolk lived openly with his mistress, while his estranged Duchess complained of her mistreatment loudly and often, to anyone within range. • A politically conservative dynastic schemer, in a time of shifting politics and ubiquitous scheming. Two of his nieces became Queens of England. Both lost their heads. • Henry VIII sent him to the Tower in December 1546, suspected in his son Surrey’s unauthorised heraldic self-aggrandisement (see below). Norfolk was attainted and slated for execution on 28 January 1547, but Henry’s own death that day saved him from the block. • Remained in the Tower through the reign of Edward VI, released at Mary I’s accession in 1553, when he was also restored to the dukedom. If you conclude from this that he had remained a Catholic despite England’s break with Rome, you would be correct, though he was no zealot. He just didn’t like change. • Henry, Earl of Surrey, the poet. • Mary, who became the wife of Henry Fitzroy, Duke of Richmond. • Born 1517, executed 19 January 1547, age about 30. • Called Earl of Surrey after 1524, though the title was granted only for his father’s lifetime use. Henry was not really an Earl. • Raised in the household of Henry Fitzroy, Henry VIII’s illegitimate son. Two years apart in age, they became close friends. Fitzroy married Surrey’s sister Mary, but he died in 1536 at age 17. Fitzroy’s death affected Surrey greatly. • Married Frances de Vere in 1532, daughter of John de Vere, 15th Earl of Oxford, my grandfather. Though Surrey died before I was born, he was my uncle. • One of the first two English poets to use the sonnet form later employed with some success by his nephew. • Was outlived by his father, did not inherit. Surrey was infamous for his hauteur, despite his lack of an actual title, or perhaps to compensate for it. He had old royal blood on both sides of his pedigree, and he wanted everyone to know it. He fell afoul of Henry VIII for quartering the royal arms of Edward the Confessor in his own arms, not without right but without a licence. The dying king, paranoid about the impending succession of his nine-year-old son Edward, suspected Surrey of plotting to take the throne from the boy. This landed Surrey in the Tower in December 1546, and cost him his head on 19 January 1547. The king died nine days later. • Born 10 March 1536, executed 2 June 1572, age 36. • He was not raised a Catholic. One of his tutors was John Foxe, the Protestant martyrologist. • Became 4th Duke at his grandfather’s death in 1554, during Mary I’s reign. • Second cousin to Mary’s successor Elizabeth. First cousin to me. • Married Mary FitzAlan in 1555, daughter of Henry FitzAlan, 19th Earl of Arundel. Mary died in 1557 following the birth of their only child, Philip (see below). • Second marriage in late 1558, to Margaret Audley. Margaret died in 1564 shortly after the birth of their third surviving child. • Third marriage in January 1567, to Elizabeth Leyburne, recent widow of Thomas, 4th Baron Dacre. That September she died, of you guessed it. After obtaining the wardship of his Dacre stepchildren, Tom married the young girls to his own young sons. Inheritances were involved. Mary Stuart arrived in England in 1568, an unwanted guest. In 1569, Tom became the Tower’s guest by his enthusiasm for making Mary his fourth spouse (and he hers, though her third was still alive). Subsequent to Tom’s contrition and release in 1570, he idiotically became embroiled in a further scheme to supplant Elizabeth with Mary: the Ridolfi plot. Elizabeth and Cecil had had enough, and Tom went to the block in 1572. His lands and titles were forfeit, thus his erstwhile heir Philip did not become the next Duke. Some of the lands were eventually returned, but it took a further three generations before Tom’s great-great-grandson, another Thomas, despite being non compos mentis (he lived much of his life in an Italian asylum), became the 5th Duke of Norfolk in 1660, at the Restoration of Charles II. • Born 1557, died in prison, October 1595. • Named for his godfather, King Philip II of Spain, husband of Queen Mary I who was sovereign at the time of Philip’s birth. • Only child of the 4th Duke by his first wife. • Married his stepsister Anne Dacre in 1569, when they were both twelve years old. Two years later, upon reaching the age of consent, they were married again. • Philip did not inherit the Norfolk dukedom due to his father’s attainder, but in 1580 he became the 20th Earl of Arundel upon the death of his FitzAlan grandfather. Following his wife’s conversion in 1582, Philip also became a recusant Catholic, which was not a good thing to be in England in the 1580s. In 1585, he tried to flee abroad. His ship was stopped, and he was brought back a prisoner and sent to the Tower. His timing was horrible. Mary Stuart was finally tried in 1586 and executed in 1587. The Armada, sent by Philip’s Spanish godfather, made its unsuccessful attempt at invasion in 1588. Over this period Philip was fined, tried, and convicted, but never actually executed. After ten years in the Tower he died there of dysentery in October 1595. In the banner at the top of this post, that’s his name below his father’s in the floor of the Chapel Royal of St Peter ad Vincula. In the early 19th century, the family began to use Fitzalan-Howard as its surname, to include the Arundel family name of Mary FitzAlan, Tom’s first wife and Philip’s mother. The present holder of the Norfolk title (and quite a few others) is Edward Fitzalan-Howard, 18th Duke of Norfolk, who was born in 1956. In 1970, Philip Howard was canonized by Pope Paul VI. His tomb and shrine lie in the Cathedral Church of Our Lady and St Philip Howard, in Arundel, West Sussex. And so my substitute brother Tom Howard, one of the very few non-Catholic Howards, was executed for his part in Catholic plots against the English crown, and was the father of a Catholic saint. Even Shake-Speare couldn’t make that up. Posted on 10 March 2018 19 July 2018 by @edevere17Posted in Authorship (of Shakespeare), History, Military/Naval, Personal Stories, Richard III, ShakespeareTagged Biography, Birthdays, Executions, Frances de Vere Howard/Countess of Surrey, Genealogy, Hall's Chronicle, Hans Holbein the Younger, Henry Howard/Earl of Surrey, Henry VII, Henry VIII, Howard (family), John de Vere/13th Earl of Oxford, Mary Stuart/Queen of Scots, Philip II (of Spain), Richard III, Sonnets (discussion of), Thomas Howard/4th Duke of Norfolk.